B-stock er et produkt som har været ude hos kunden og som har anvendt de 30 dages returret, eller været i oppe vores showroom. B-stock kommer med fuld 3 års garanti, som var det en ny, og naturligvis også med de sædvanlige 30 dages returret. - Har en skramme og hak i kabinettet, men teknisk i perfekt stand. SuperNova MKVI 15″ - Den Ultimate bass oplevelse - Helt ned til 14 hz! The Supernova MKVI Series epitomizes the state-of-the-art in subwoofer design. The MKVI series is uncompromised performance and superior technology coupled with the world's most refined low frequency response. The MKVI defines a new standard in a class of its own. The selection of subwoofers is vast, but at the top Supernova MKVI reigns in solitude. With more patented technologies and test awards than any other subwoofer, the MKVI continues the legacy of the legendary MKV series. MKVI differs from its predecessor with the introduction of the revolutionary IQ600 class J amplifier and full DSP with phase and time control. Patented technologies such as Class J amplifier technology, Overdrive, ODL, SLAPS, DBXI and Magma X define MKVIs groundbreaking performance. If you dream of uncompromising LFE performance with superb dynamics and effectiveness-, combined with quick and precise articulation, the MKVI is the obvious choice. The MKVI can effortlessly produce the lower octaves in a high-end stereo setup or add explosive LFE effects in large surround sound systems. Supernova MKVI is covered in deep luxurious black piano lacquer. The cabinet finish begins with a thorough sanding and priming followed by multiple applications of black lacquer with additional fine sanding between layers. The cabinet is then finished with a smooth, high gloss clearcoat. The elegant piano lacquer complements its compact modern design and adds sculptural finesse and exclusivity to your home. 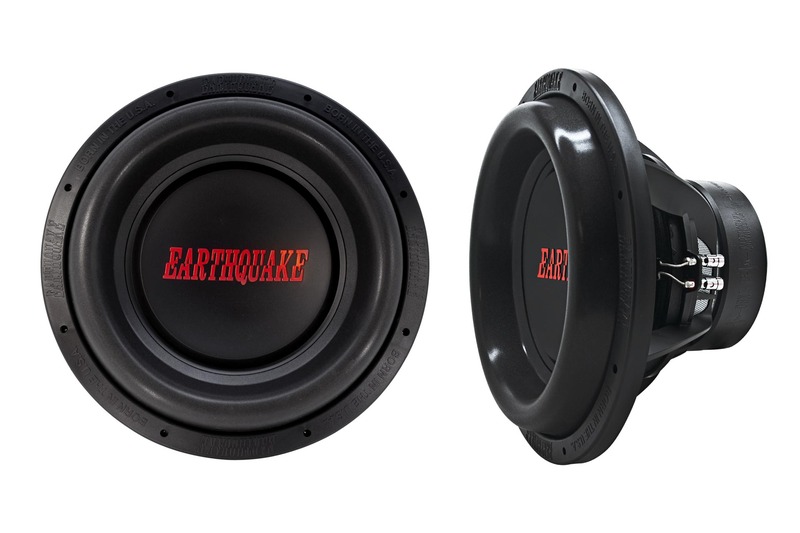 Several manufacturers have some type of room correction built into their subwoofers. Most are based on level adjustment by volume which is a very simple equalization function. EQ does not address the listening room's phase and time related difficulties. MKVI has genuine room correction which takes into account reflections, refractions, arrival and EQ. This complete DSP solution ensures optimum acoustic integration in any room. MKVI's brute force springs from the newly developed IQ600 class J amplifier. The patented Class J technology manifests a quantum leap in amplifier technology. The revolutionary aspect of Class J is its ability to combine a high efficiency of 99% with extraordinary bass control. Class J is an evolution on PWM technology that combines advanced multi-level feedback with an intelligent controller. It modulates the supply voltage and output switching frequency in real time based on the frequency and amplitude content of the input signal. This added level of intelligence to the amplifier offers several obvious advantages such as increased thermal headroom through the amplifier's optimum energy use, dramatically improved bass response and dynamic power capabilities. This results in a harder audible impact that adds a drive to the sound normally experienced only at live concerts. This combined with superb articulation, nuances and details are reproduced by the MKVI, but overlooked by traditional subwoofers. The patented technologies combined with a dramatically oversized power supply makes the IQ600 amplifier capable of delivering raw quantities of continuous power. The power supply is based on a rigid silicon-steel hard-wound low regulation 750VA toroidal transformer. The large and heavy transformer ensures a stable supply without voltage drop even at rigorous and continuous operation. The IQ600 amplifier provides 1200 watts continuously for unlimited time at 18dB crest factor and 600 watts TSP (True Sine Wave Power). This is real performance power the amplifier can deliver and a power the woofer driver is engineered to withstand and utilize. Overdrive is a patented system that gives the amplifier exceptional high dynamic output. The starting point for the Overdrive system is a constant monitoring of all amplifier power resources coupled with an intelligent dynamic high voltage supply. Information from the power amplifier is translated by the overdrive system into a dynamic power matrix which calculates the dynamic power potential in real time. A traditional amplifier will attempt to reproduce a transient signal although its duration exceeds the amplifier's resources which leads to speaker damaging distortion. Overdrives patented design ensures distortion-free amplification combined with optimal and safe use of all power resources. Sound is dynamic by nature therefore optimization of dynamic power resources is essential. Overdrive provides a peak power double the IQ600's nominal specification making the amplifier capable of reproducing 1200 watt program material. The patented Optical Distortion Limiting circuit is a novel design that provides full protection against distortion. The uniqueness of this design is that the audio signal remains immaculate, as ODL is not in the signal path. Traditionally, the signal runs through the protection circuit thereby complicating the signal path. ODL insulates the protection circuit behind an optical coupler. The delicate input signal meets a Y-sensing and the signal is duplicated. The original signal continues untouched to the amplifier section. The duplicated signal is translated into light where ODL compares it with the power amp section. The use of light gives ODL a response time unattainable in a conventional design. If ODL detects an overdriven signal that can not be amplified nominally or by Overdrive, ODL ensures distortion-free amplification by adjusting the input power in real time. SLAPS technology is a key player in translating the IQ600 amplifier's high power into dominating LFE. SLAPS is a patented system that dramatically increases subwoofer efficiency and capability for ultra low frequency reproduction. SLAPS stands for Symmetrically Loaded Audio Passive System. As the name indicates, SLAPS is built symmetrically which distinguishes it from traditional passive devices. SLAPS integrates identical components in its suspension and design ensuring the unit is moving identically in both directions. The revolutionary efficiency and performance are the result of the pneumatic coupling between SLAPS and the active driver DBXI/MagmaX. SLAPS overcomes the limitations known from conventional closed and ported designs that prevent radical excursion and deep response. The unique design allows the active driver compression-free movement resulting in deep, dynamic and hard-hitting bass response. The radical DBXI driver in MKVI effectively converts electrical energy into physical movement. The mechanical construction is of superior quality, evident in the almost absurd over-building of all components. This is further enhanced by adding TCT (Turbine Cooled Transducer) technology. TCT is a patented Earthquake exclusive technology that implements a fixed turbine vane impeller in the magnet gap. 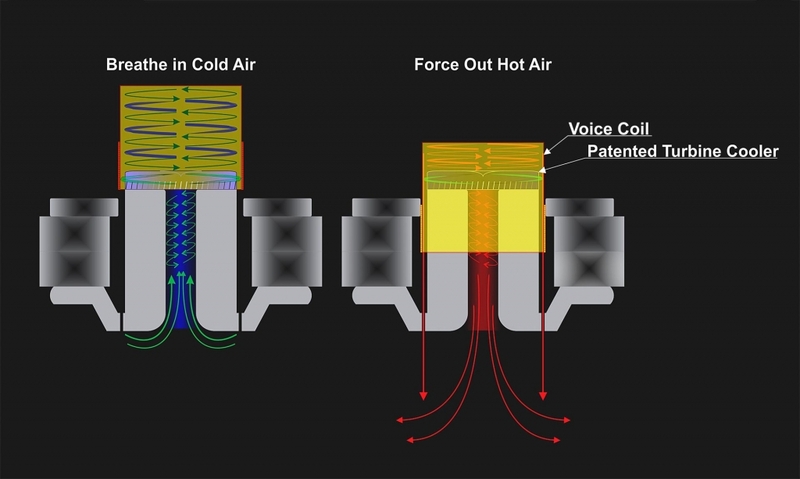 It forces the drawn in air to rotate in a vortex pattern against the aluminum voicecoil former, this exponentially increases the surface contact of the cooling air. The result is a 3 db increase in sound output at rated power compared to the same transducer without TCT. X-mech of more than 3.5"
DBXIs intelligent design coupled with the overbuilt motor system results in a device that is always electrically controlled by the amplifier. The strong reactive electromagnetic coupling ensures that the device remains compression free and will not brake itself mechanically. The high edge surround combined with the super spider allows huge excursion. The electrically controlled and mechanically unhampered movement of the driver results in a transient response with dynamic capability previously unheard of.